The new MINI3 – the ultimate portable modeling amp; agile and versatile with features that make it the perfect fit for every musician! The popular MINI3 is now available in Classic VOX garb: Black vinyl wrap and Brown Diamond fretcloth. Choose the style that's right for you: rock-ready black; vintage-feel ivory; racing green – for a distinctly British look or the new Classic in traditional Vox livery. From the versatile JamVOX to the acclaimed Valve Reactor and Valvetronix series amplifiers, VOX has earned a reputation for premium modeling technology. The MINI3 is no exception, delivering 11 accurate and authentic amp models covering a broad range of styles and playing techniques. Starting with the coveted VOX British tone, the MINI3 also offers the sounds of classic historic amps, today's intense hi-gain amps, and hard to obtain rare "boutique" amplifiers. A pure, non-distorting clean model is included in the eleven amp types. This allows nearly any acoustic instrument fitted with a pickup or an acoustic-electric guitar to be connected to the MINI3, providing a rich and satisfying tone without losing any of your instrument's acoustic resonances or nuances. This setting is also ideal for use with a keyboard or workstation, allowing the MINI3 to function as a portable PA system as well as a guitar amp. The MINI3 provides both effects and reverb/delay for putting the final touches on your sound. The effects section offers a compressor, chorus, flanger, and tremolo. Two reverbs and two delays are also available. Each effect is easily editable for creating your own signature sound. Dedicated knobs integrate effect selection and parameter adjustment, ensuring intuitive control – even for a beginner. Tap tempo control makes setting the delay time to match the music a snap! As its name suggests, the MINI3 is ultra-compact. Your MINI3 includes a convenient, detachable shoulder-type carry strap for transporting your MINI3 with ease. It weighs a mere 3.5 kg, so you won't get tired of carrying it around. In addition from getting from point A to point B, the MINI3 can be played at any point along the way! Six AA alkaline batteries can provide up to 30 hours of on-the-go power – ideal for outdoor use and street performances. An AC adaptor is included for playing while connected to an outlet. In addition to the main guitar input, the MINI3 provides a separate mic input, complete with its own volume knob and control of the reverb/delay amount. This dynamic addition offers you detailed control of your overall sound. Plus, we have also included a convenient AUX input jack for connecting an MP3 player or other audio source. Jam along to your favorite tunes, practice those tricky licks, or play along with pre-recorded backing tracks for a full-fledged performance – all by yourself! Sound quality goes without saying, but VOX's inimitable sense of design is another real attraction of this amp. The MINI3 carries on VOX trademarks such as diamond grill cloth and textured vinyl cladding, making it a tasteful addition to any room. In addition to our proven and popular black, the MINI3 is also available in a vintage-vibe ivory. British racing green and Classic VOX black & tan. 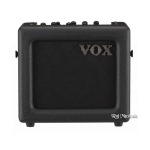 Raj Musicals is an authorized dealer of VOX products.